... Ghana's investment confidence on rocks Pink Aviation Services,the reputed European skydiving company which has been locked up in an unending controversy with the Ghana Armed Forces over the sale of four scrapped Skyvans has carried their fight to the worldwide web where they have set up an “official” scandal website for the Ghana Air Force. The Website, which has attracted huge patronage from the European business community, can be found on the link www.ghanaairforce.com, where Pink Aviation tells of near robbery of their investment while doing business in Ghana. A very high level European business group has already written to Mr. Thomas Lewetz, CEO of Pink Aviation, saying “you have lost a significant amount of money in what appears to be a business deal gone purposely bad in a third world country, a predicament I certainly did not expect from a country/government such as Ghana.” The opening paragraph of the website states that, “This site has been established to protect aircraft buyers and us when dealing with the Ghana Armed Forces. Ghana Air Force does not own any more Short's Skyvan SC7, they have been sold to Pink Aviation.” According to the website, the Ghana Air Force grounded four of the Skyvans with tail numbers G450, G454 and G455 because of lack of maintenance and spare parts. “The Skyvans have not been flown since years, experiencing severe corrosion and lack of performed mandatory inspections and modification as well as maintenance and preservation. “The two airplanes have severe structural damage on the nose attachment bulkhead. Engines have been sitting on the floor in the hanger in Takoradi for years, unpreserved, unwrapped, with animals living inside,” the company noted. Continuing, Pink Aviation said that the propellers were scrapped due to an airworthiness directive by the manufacturer Hartzell in 1996 and the US Federal Aviation Authority (FAA) (AD96-18-14), adding that most spare spares have been sitting in the stores since they were bought 30 years ago. 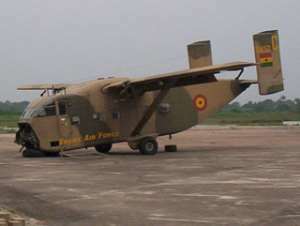 On that website, Pink Aviation rightly stated that it was based on these conditions that Ghana Air Force decided to sell these airplanes as scrap and went ahead to put it on international public tender. “We, Pink Aviation Services operating Skyvans since 1998 placed a bid (See Bid). The Ghana Air Force has accepted this bid including provisos, and they requested us to transfer the money to their account in Ghana. The money was transferred, the receipt acknowledged and a document from the Ghana Armed Forces was issued on February 4, 2004 confirming that the ownership had been transferred to Pink Aviation Services. (see document) “Following a notification of Wink's win (of the bid), Pink Aviation Services proceeded with investments necessary to ferry the aircraft home; incurring large financial burdens for labor and heavy expenses associated with new parts and extensive engineering costs,” Pink Aviation said. The Skydiving company confirmed that currently all the 4 Skyvans have been registered in Europe in the name of Pink Aviation with the tail numbers OE-FDP (SH1929), OE-FDL (SH1930) and OE-FDI (SH1932) and OE-FDX (SH1933). Continuing with the story on the website, Pink Aviation said they started maintenance work on SH1930 and SH1932 to make them ready for a ferry flight to Klatovy-Tunisia where further refurbishment was expected to take place, adding that as these two Skyvans became ready for ferrying, the Ghana Armed Forces issued a letter stating that the sale of the four Skyvans was cancelled and may be put again on tender. This, according to Pink Aviation, is not even acceptable even under Ghanaian law. They added that beside the money they paid to the Ghana Armed Forces, as purchase price for the cost of scraps, they invested close to $80,000 directly into the aircraft, adding, “We purchased parts such as propellers and engines worth $750,000 which had already been paid. “Pink Aviation lawyers in Ghana replied by a letter dated February 27, 2004 that the cancellation is not acceptable. The Ghana Air Force did not reply to this and neither paid back any money for the maintenance work done by Pink Aviation on the airplanes, nor the money paid for the airplanes. Pink Aviation noted that the Ghana Armed Forces was trying to reverse a completed process made under terms and again, place the exact same aircraft under a new tender without consideration or compensation to Pink Aviation. “Our Ghanaian lawyer as well as the Ghanaian Ministry of Justice told us that, that this was not lawful,” Pink Aviation said. The Chronicle has not confirmed this with the Justice Ministry. DEFENCE MINISTRY POINT Meanwhile, speaking in an interview with The Chronicle last week, the Minister of Defence, Dr. Kwame Addo Kufuor, said he only got to know of the deal at a certain stage and that as the Minister, he thought he should have been fully informed about the transaction. According to the Minister, concerns had been raised that the aircrafts had been sold cheaper than they should have been, so he had ordered an investigation into the matter. In a separate interview with the Airforce Commander AVM E.A. Mantey, he said the Skyvans were bought about 32 years ago until they were grounded by the Air Force some years back because of “uneconomical maintainable costs” and also the fact that they had become old and were breaking down frequently. He added that spare parts for the Skyvans were hard to come by due to budgetary constraints. The Chronicle has learnt that Shorts, manufacturers of spare parts for Skyvans are no longer in operation. AVM Mantey said the Ghana Airforce declared the four aircraft “unserviceable” so a board of survey was convened in September 2002 to start the process of boarding the aircraft. Based on the recommendations of the board, the Ghana Armed Forces advertised internationally for the sale of the aircraft in December 2003 by auction in-situ. According to the Air Force commander, Pink Aviation won the bid at an auction price of $42,000 but it was later realized that the valuation carried out by the General Headquarters of the Armed Forces Logistics Unit was not properly done because the auction price did not include the cost of the spares available. But all the GAF documents regarding the sale of the aircrafts indicated the scraps were being sold with spare parts and unserviceable engines. The Air Force Commander said in that circumstance, the scraps were revalued at $240,000, adding that the boarded aircraft were to be consigned out of the country as scrap and not refurbished aircraft to be flown out of the country. Following this development, Wing Commander Mantey said the winner of the bid was called for renegotiations of the contract price. Meanwhile, Pink Aviation has refused the renegotiation offer from GAF, saying that after 18 years of being in the aviation industry, they are honestly convinced that the price they offered for the scrap was very reasonable and that if the Ghana Armed Forces can sell the aircraft to anybody at the price they are quoting, then they got an idiot. GAF has since prevented Pink Aviation from gaining access to the aircraft, but the fact remains that the aircraft has been legally sold to Pink Aviation and registration of the aircrafts is currently in the name of Pink Aviation.